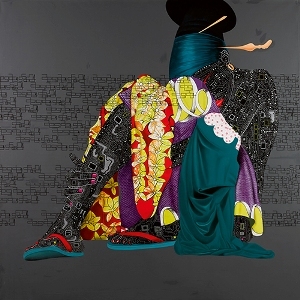 Contemporary African Art, Issue #009 -What does it mean to be ‘African’ in 2018? What does it mean to be ‘African’ in 2018? Right now, it’s about chartering a way forward for all who reside on this amazing continent.. animals and humans who share the habitat.. history and future each having its place in the present.. and human values finding common ground. 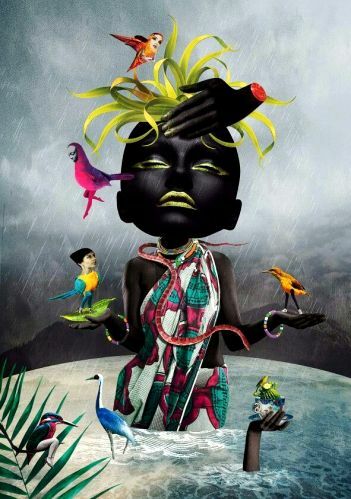 With this edition I have decided to throw you into the realm of fantastical art from Africa showcasing artists, (local and foreign), who use Africa as their inspiration to create art where imagination reigns and images are designed to confound the eye and stimulate the mind. They seek to engage the viewer to imagine new things, to cross boundaries and to be transported. With abundant creativity the borders become blurred and anything is possible. The digital world has allowed this to happen with a degree of ease but there are only a few masters who have the talent to take us beyond design, to be transported to other worlds with their technical and conceptual skills. Other artists achieve this equally well with drawings, paintings and sculptures. There is delight and amazement to be found in all the following artists work and I hope you enjoy finding out all about them. 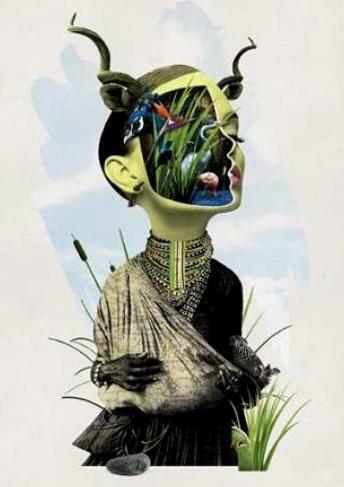 SA artist and graphic designer Medium: digital collage. Miller combines traditional skills and photography with modern technology in a highly accomplished and original way. Lots of colour, humour and playfulness pervades her work. From the first time I saw Karin Miller’s work I was drawn to it for its technical prowess and its highly imaginative content. Each piece tells a story that is at the same time both comfortable and edgy, a tension existing in the arrangement of the carefully chosen images in unexpected combinations. Her own description of her work explains the draw: “Beauty is given the trump card. Beauty affirms our sense of comfort, which is visualized by balance and symmetry and presents us with a sense of warm reassurance. 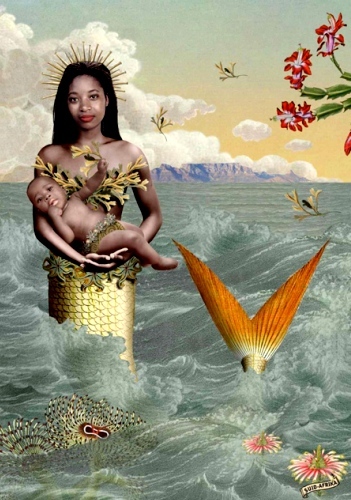 A trained graphic designer as well as, more recently, a practicing applied fine artist, Truman-Baker specializes in producing art prints of her digital collages. Her design process is a journey through her subconscious, exploring her physical and emotional reality… each collage has many layers of textures and images built up over time until the composition is complete. 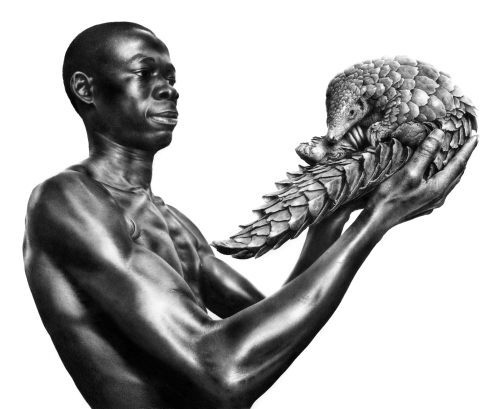 Mythical beasts, flora and fauna inhabit her pictorial worlds to form rich and evocative imagery. 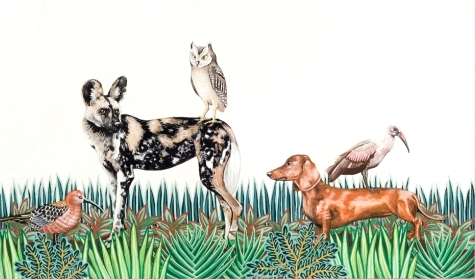 Animals and humans often live side by side in fantasy worlds. With this artist, the fantastical exists in the extraordinary technical skill of this artist. Filer creates hyper-realistic art and it especially effective when he mixes realistic images with an invented composition such as we see below. ‘Love, Death and Birth’ One has to look twice to see whether these black and white images are indeed photographs or not. The intense contrast of light and dark, the soft graphite qualities and the clever offline, asymmetrical compositions are deliberately accentuated to create very powerful, intense images.. they are no longer just drawings but are projections of his imagination. A master printmaker by trade and design, she also works with gouache on paper, with paper cut-outs and with gold leaf. Her recent series is an exploration of life, death, memory and place. 'Which way?' 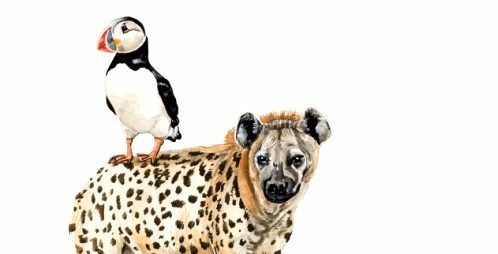 Sarah Pratt creates inventive, magical pieces which manage to transport us to worlds where exotic, extinct, domestic and wild creatures live side by side in extraordinary surroundings and whimsical situations. 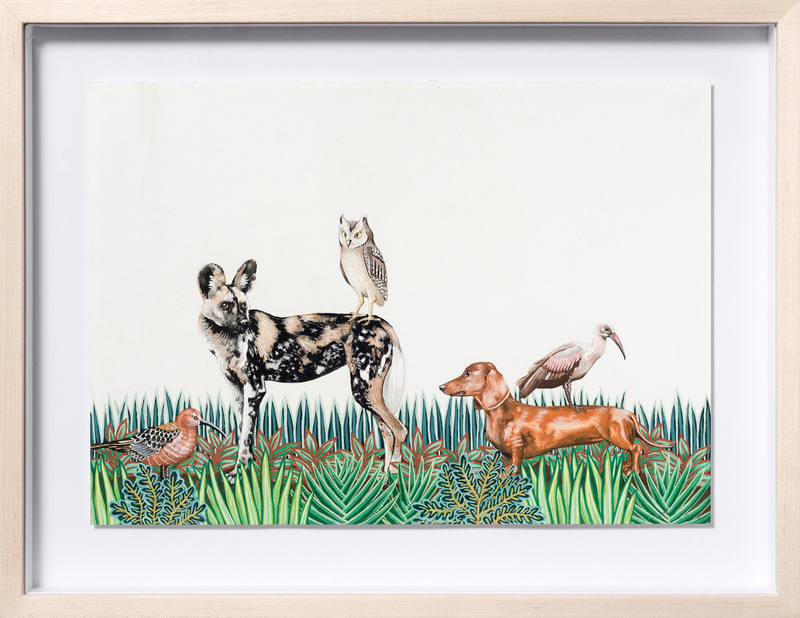 Spaces are defined by detailed borders of flora with decorative foliage but within the central areas animals and birds encounter each other in ‘other worlds’. 'Best view', Migration, Salon 91 Her newest exhibition ‘Migration’ can be seen at Salon 91 for most of the month of February and at Cape Town Art Fair. Lives and works in New York State. 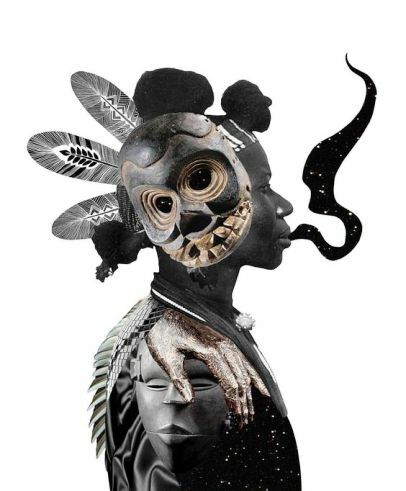 His highly creative, futuristic digital imagery is inspired by African culture of kings and masks, gold and gems and the African people themselves. 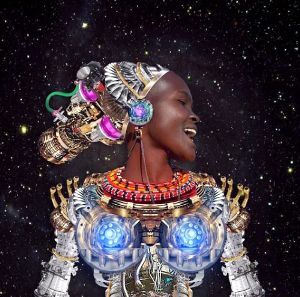 His intention is to remind people of African descent that they have a heritage, rich in colour, meaning and creativity and his pieces serve to jolt those memories in a very modern way. 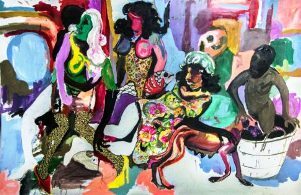 Southern Africa and particularly Cape Town seems to be a flourish with auctions, fairs and exhibitions in February and March. Including a section called Tomorrows/Today featuring new leading lights in the contemporary art world. DESIGN INDABA, Artscape Theatre Centre, Cape Town 21-24 February 2018 inclusive. The Design Festival is a showcase of the best in design and creativity. Going beyond design to create a multi-sensory event where you can hear, see, learn and experience the future of creative thinking and design activism. The Design Conference includes a line-up of thinkers, artist, exhibitions and performances. Nightscape festival adds extra fever; an inner-city experience immersed at the Piazza. 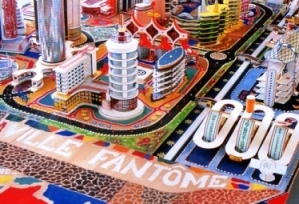 Congolese artist and would-be, visionary architect and city planner. Created what he called “Extreme Marquettes” – models made out of paper, commercial packaging and increasingly unorthodox materials from everyday life. The exhibition spans 3 decades or 3 significant periods of his life. Do not miss this extraordinary show if you plan to be in NY this year!! 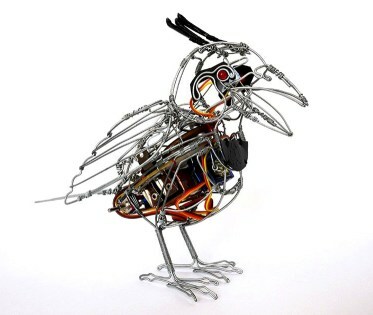 Artist Ralph Borland of Side Street Studios takes wire animals crafted by African street artists and makes robots with them... a fabulous collaboration! I do hope you have found this ninth edition of CAA newsletter has taken you to an 'other' world where your imagination has run riot and anything seems possible.. in Africa, in 2018!